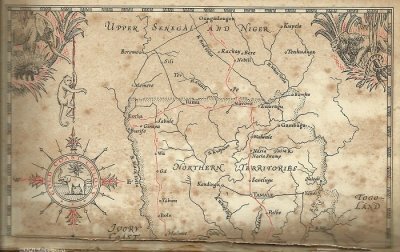 When I tell people I am working on the history of Nashdom's foundation in Ghana, I always get the same response: " I didn't know Nashdom had a foundation in Africa!" It was indeed short lived (1923 - 1931) but had a lasting influence on the development of the Anglican Church in Ghana. 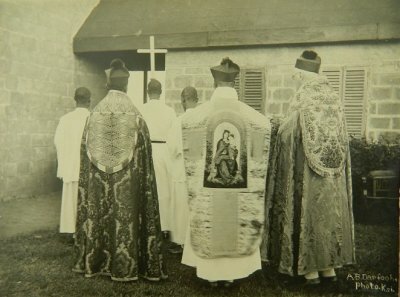 The photo shows two of the monks (Fr Martin Collett and Fr Peter Harris) with Prempeh I, the Asantehene, who in 1924 had been allowed back to the Gold Coast from exile in the Seychelles, just a year after the monks arrived in Kumasi. 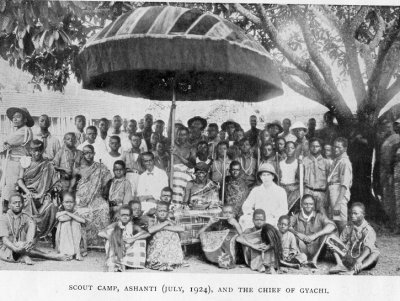 The British Colonial Government would at first only allow Prempeh the status of a private citizen, "Mr Edward Prempeh", but for his people he continued to be the King of Ashanti. Prempeh had been converted to Christianity during his long exile and had been baptised as an Anglican. That, too, complicates the story of this monastery : a colonial Church which found itself at the heart of an African "establishment". There was nothing ordinary about this place. Strictly speaking, St Gregory's Monastery, Kumasi, was not a foundation of Nashdom but of Pershore Abbey in Worcestershire. 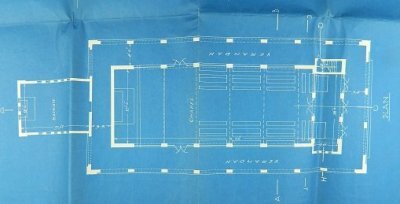 The move to Nashdom came only in 1926. 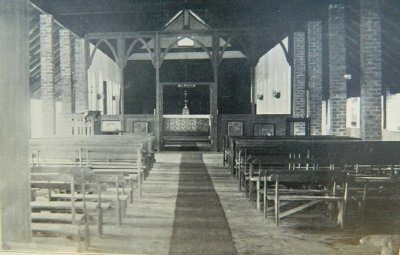 Pershore was the Anglican continuation of Caldey Abbey after the majority of the monks on that Welsh island decided to become Roman Catholics in 1913. They are therefore our monastic cousins, despite the difference of denomination. 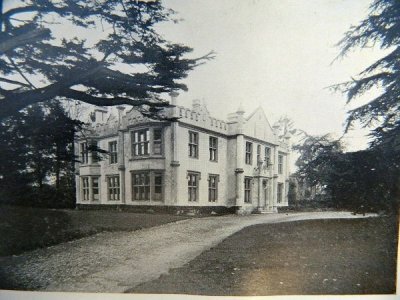 The Pershore community officially opened on 1st May 1914 and, after a rather shaky start, established its own identity under Abbot Denys Prideaux. Although only a Regular Oblate and not a monk in vows, he had been well known to many of the visitors to Caldey as Warden of the Guesthouse under Aelred Carlyle. In 1923, when the community was still only nine years old and very weak in terms of monks in Solemn Vows, Abbot Denys made the surprising decision to send some of his most promising monks to the Gold Coast. He had received an invitation from Bishop O'Rourke, Anglican Bishop of Accra the previous year. 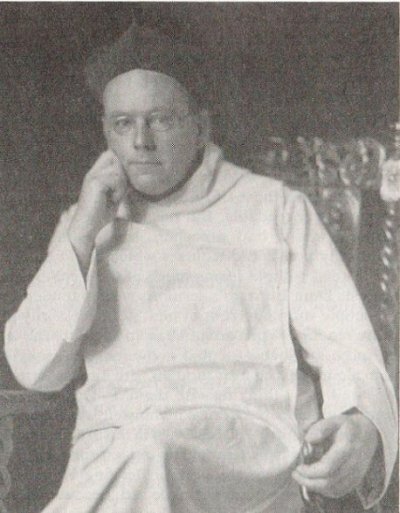 Dom Gregory Dix, the famous liturgist, also spent some time in the Gold Coast in 1927. He had been intended as a Lecturer for the Theological Training College but spent much of his time in hospital with appendicitis, and eventually had to be invalided out of the country. The monks' work was not confined to Ashanti. Dom Dominic Carter was ordained in Sekondi Cathedral within months of arrival and was quickly reassigned by the bishop of Accra from Kumasi to Christ Church, Cape Coast, and from there was transferred to Sekondi. 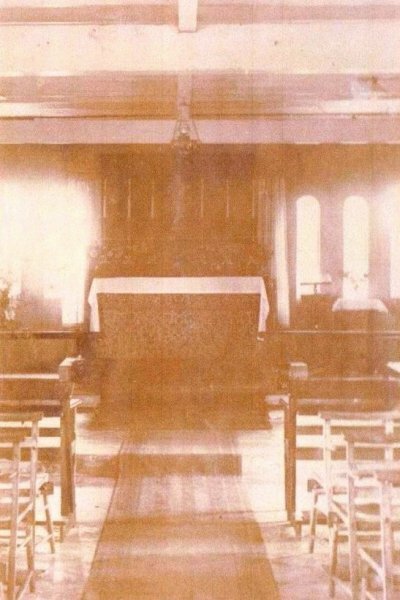 St Andrew's Church, Sekondi, was destroyed by fire on Friday 5th February 1932, but this rather faint sepia print shows the church as Fr Dominic Carter would have known it. The church was on the ground floor, the bishop lived in a bungalow above it. 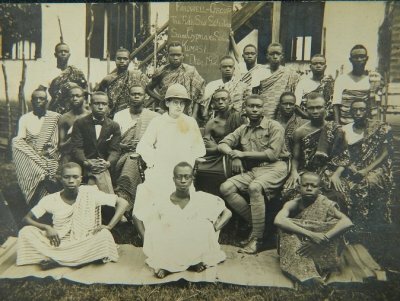 The monks of St Cyprian's Church, Kumasi, had two royal visitors from England in 1925: The Prince of Wales (the future Edward VIII), and Princess Marie Louise. 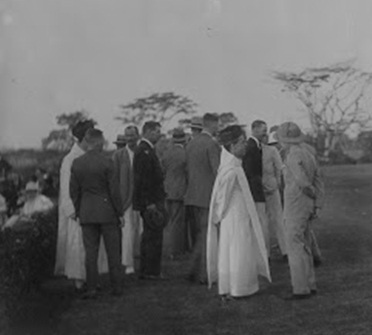 This photo shows Fr Martin Collett talking to the Prince of Wales (right foregound, with his hands behind his back) in the grounds of the Residency in Kumasi. There is another monk on the left of the photo whose face is unfortunately obscured. 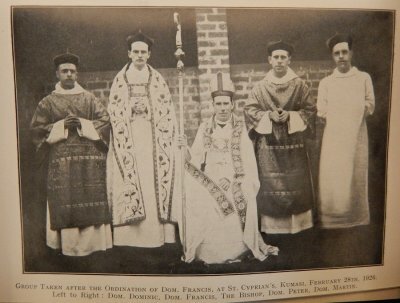 It must be Fr Francis Wheeler since Fr Martin and Fr Francis were the only two monks present when Princess Marie Louise visited at about the same time. Princess Marie Louise wrote up her encounter with the monks in her "Letters from the Gold Coast", which was among the books given us by Nashdom in 1989. An additional interest lies in the end pages which have a map of Princess Marie Louise's tour, because in 1930 Fr Peter and Fr Bernard went north, retracing her route, in search of a site for a new monastery. 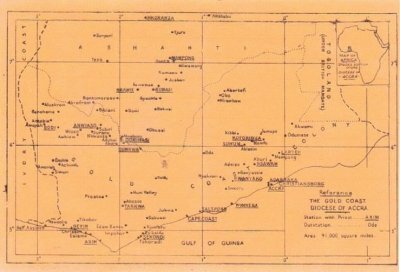 They had settled on the area between Wa and Lawra in the Upper Territories (now Upper West Region) as a suitable location and had reported back to the Bishop of Accra requesting that he approach the Government to have this area assigned to the English Church Mission as a territory for Anglican development. Sadly, it was not to be. 1930 was a year of crisis. Both Fr Peter and Fr Dominic decided to become Roman Catholics and left the community, returning permanently to England and leaving Fr Bernard Clements alone in the Gold Coast to run the seminary. Abbot Denys Prideaux took the inevitable decision to recall him to Nashdom since there was no longer a vestige of monastic community. Fr Bernard left the Gold Coast obediently but reluctantly, asking his African students to pray that the Lord would open a way for him to return one day. In particular, he was hoping to return as a missionary to the Northern Territories. Instead he found himself invited to become Vicar of All Saints, Margaret Street, in London. It was one of the most celebrated churches of the Anglo-Catholic movement and Dom Bernard Clements made a brilliant name for himself as a preacher and broadcaster before his premature death in 1942. Br Bernard Clement Ananie fell seriously sick and had to be admitted to hospital. He came close to death. On medical advice he left the community and returned to Ghana in 1960. Br Francis Thompson also left around 1962 during simple vows and returned to Accra where he was ordained deacon on 29th September 1963, then priest (in Cape Coast) on 30th August 1964 - and finally bishop of Accra. The last direct link between Nashdom and Ghana was Fr Cyprian (Henry) Martin, an English missionary who had spent eleven years in the Gold Coast (1948-59) as chaplain to St Monica's, Mampong. He arrived as a novice at Nashdom in 1959, was professed in 1961, and later represented Nashdom at the consecration of the new St Cyprian's Cathedral, Kumasi, in 1973. He preached at the Pontifical Mass of Thanksgiving for the inauguration of the Anglican Diocese of Kumasi on 10th June, 1973. 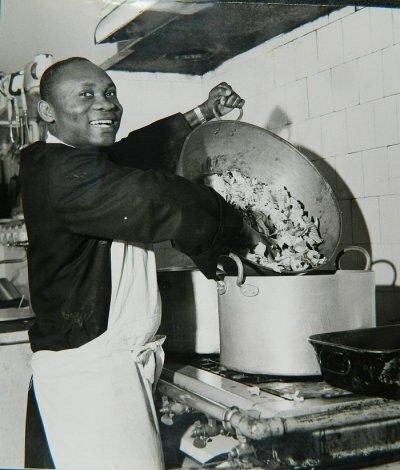 Dom Cyprian Martin was made Prior of Nashdom in 1979 and died of a heart attack on 23rd January 1982. 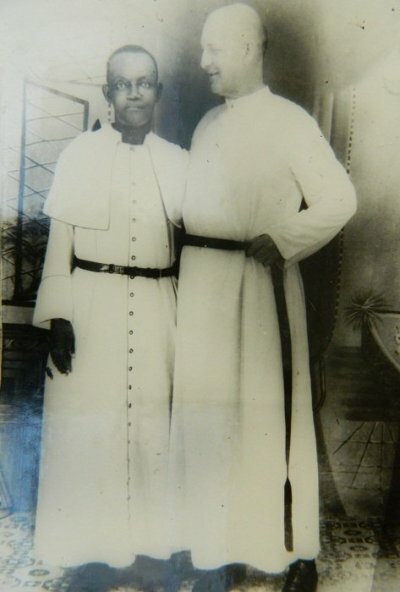 The photo was taken at Cape Coast and shows Fr Henry Martin with Ven. K.P. 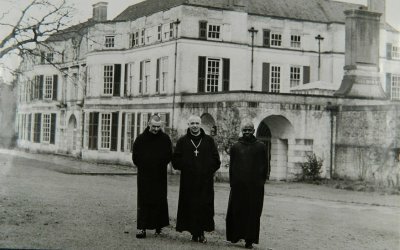 Sakyiama, one of Fr Bernard Clement's original students at St Augustine's College. Fr Sakyiama went on, in 1961, to become Priest-in-Charge of the old Benedictine Parish of St Cyprian's, Kumasi. 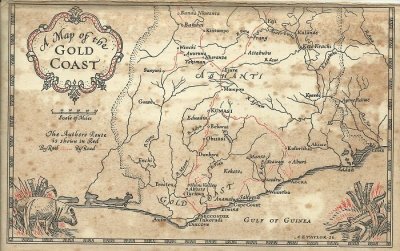 Picture Credits: Nashdom Archive (including plates from "Laudate"), except for: Map from "The Golden Shore" (St Nicholas Seminary Library, Cape Coast, Ghana); "St Andrew's Church, Sekondi, before the fire of 1932" (Private Collection: Mr T. Sakyiama, Cape Coast, Ghana); "Dom Bernard Clements in Africa", from Good & Faithful Servants: The Vicars of All Saints' Church, Margaret Street, London W1, by Peter Galloway & Christopher Rawll, Worthing 1988, p. 135; "The Prince of Wales with Fr Martin Collett", Blog of Mr Peter Dixon, The Nashdom Chronicles; "Endmaps from Letters from the Gold Coast, London 1926, by H.H. 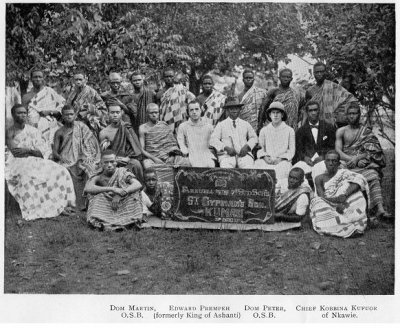 Princess Marie Louise", Kristo Buase Monastery Library; group photo at Fr Francis Wheeler's ordination from "The Golden Shore" (Magazine of the Accra Diocesan Association), 1926: copy from the SPG archive, Bodleian Library, Oxford.